Hello! Happy WW Wednesday! My WW content has really been popular over the last week. I'm so happy I decided to do this. I filmed a video this week on how I setup my WW planner. 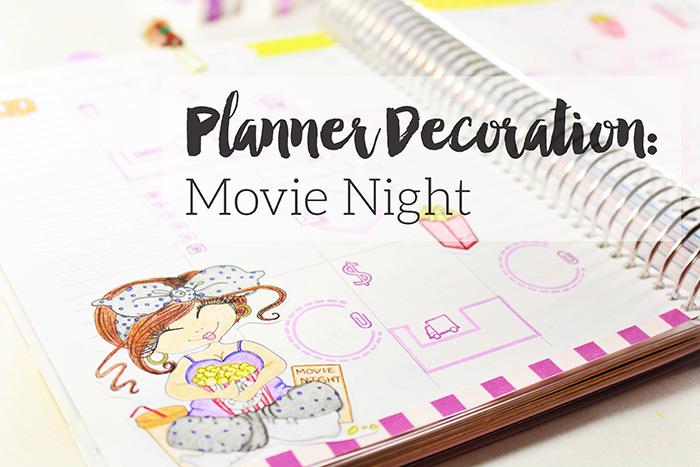 That was so popular in the planner groups, it sprung a new group for WW planners! I do weigh in on Mondays. I find it's easier to just start the week out fresh with my points on Mondays. Some people might find having the weekend lead up to weight in would be sabotage. Luckily for me, I work weekends. So it's easy for me to stay on track on the weekend. This week I was down 3.9lbs! That makes a grand total of around 14lbs in less than 2 months. Very promising! Here's the video I did of my WW planner if you'd like to see it. I'm still loving cherries! I'm also loving grape tomatoes. I have grape tomatoes with every meal. Chicken Feta Spinach Sausage from Aldi [pictured above]. The sausage is only 4sp and if you have 2 it's only 7sp. It's very tasty on it's own and doesn't need a bun or bread. It'd be great cut up and put into a pasta dish made with veggie noodles. I went simple this week and just had the sausage with a large helping of steamed Brussels Sprouts. I also found 45 Calorie bread at Aldi for super cheap. That was exciting! It's only 2pts for 2 whole slices. That makes me very happy! I love peanut butter in the summer so I'm happy I've found a lower point way of enjoying a simple peanut butter sandwich. I think I'm going to make a separate post listing my favorite finds from Aldi and the pricing. I think people think they can only get healthy and low point food options at more expensive stores. So I'm going to do a breakdown of a typical WW grocery haul for me. Anything else you'd like to see? Let me know! I have had the most productive week! Last weekend we spent several hours getting a room in our apartment organized to be my new studio. This room is the largest room in our apartment and it's amazing! I have "stations" setup for different needs. Like a filming space, a dedicated photography space, Etsy order packaging, etc. This has shaved off so much time and I'm able to create so much quicker. I'm really excited about the setup I have for filming. I'm still adjusting to using natural lighting [large windows in there] instead of my lights, so the lighting might vary for a little while. This week I had a blog post go live at Sweet Stamp Shop. It also went live here yesterday. 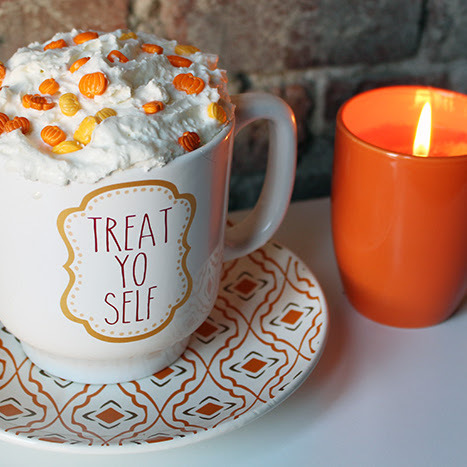 I teach you how to make a cute easy shaker gift card holder. I FINALLY picked up a fuse tool so I'm finding all of the things to fuse, haha! This weekend I put summer clips on clearance in my Etsy shop. Making room for the fall release! So be sure to check out the clips and get yourself a good discount. I plan on having my Fall Release the 8th of August. Definitely keep your eye out for that. This week I started a new series, Weight Watchers Wednesday. I'm going to be sharing my weekly experience on WW. Here's the planner I made to track everything in. I LOVE the WW app, but I wanted a planner that I can look back at easily and flip through. 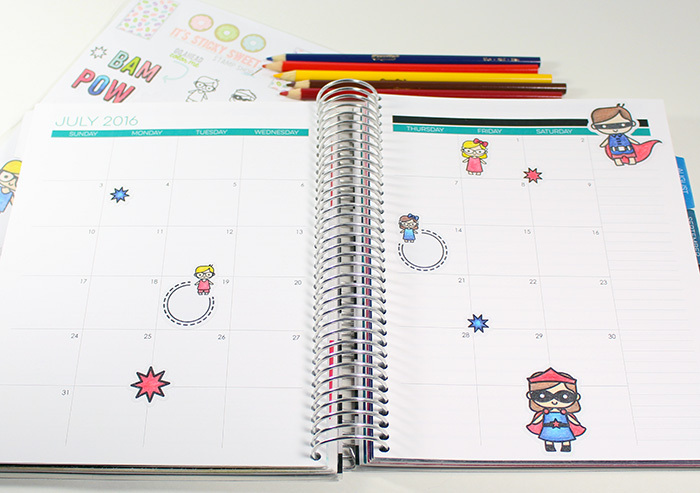 Once again this week I used a Sherri Baldy digital stamp in my planner. I just love them, so very cute. Next week I'll be shaking it up though and doing something different. So be keeping an eye on that! 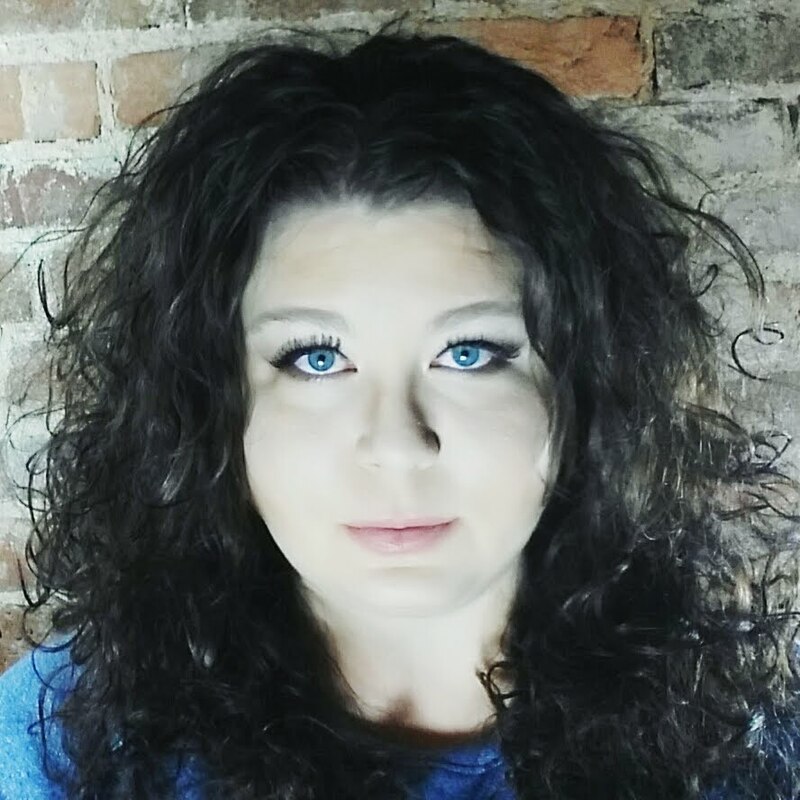 If you're not already following me on social media, you should! I've added some additional profiles, and another YouTube channel [think WW and vlogging] is coming soon. 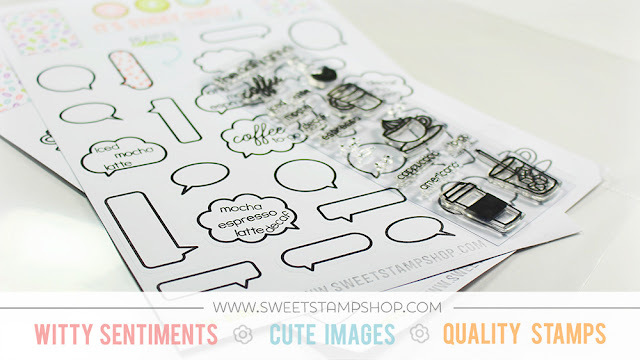 It's Sweet Stamp Shop time again! 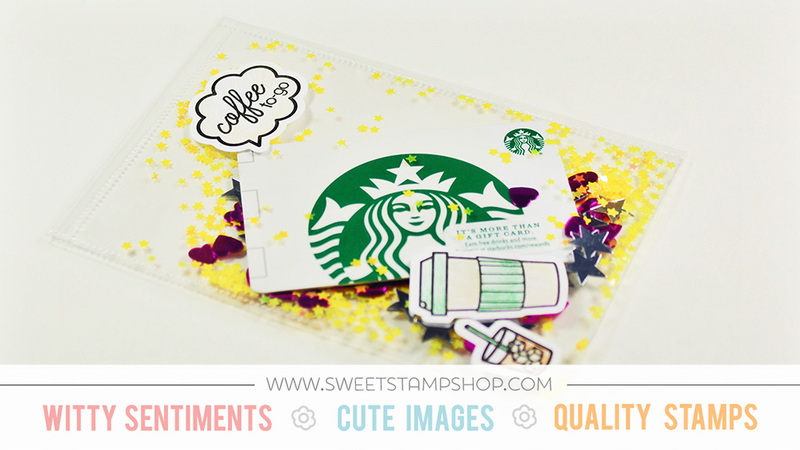 Today's post is the recent blog post I did featured at the Sweet Stamp Shop blog. Hello! Emilee here and today I'm going to show you how I make quick and easy shaker gift card holders. 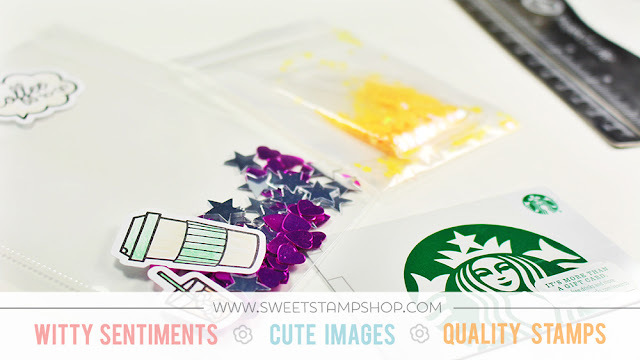 You will need a fuse tool, confetti [sequins, chip board pieces, beads, etc], Sticky Sweet stickers and/or stamps, page protector, paper trimmer or scissors, and your gift card. 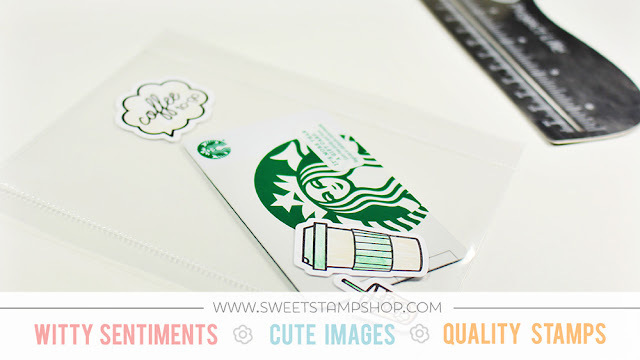 I'm making a shaker card holder for a Starbucks gift card, so I chose the Sticky Sweet sticker sheet "Coffee" and the stamp set "Cuppa Coffee". I also grabbed Sticky Sweet "Bubble" to stamp coffee sentiments onto from the stamp set. Measure out how much of the page protector you will need to create the proper size for the card. We're putting EVERYTHING into the shaker card so you'll want to leave plenty of room in it. I sealed off 3 sides and left the top open for now. Next I added my Sticky Sweet stickers where I'd like them to be directly on the front of the page protector. 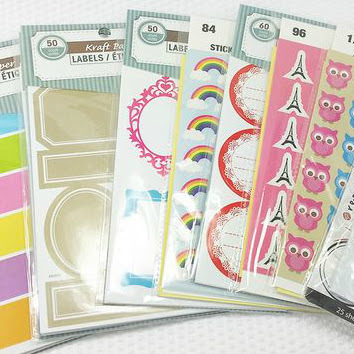 You can color your stickers prior to placing them if you'd like. I waited until after I placed them because I wanted to see all the colors of the confetti inserted before I decided on colors for the stickers. Slip your gift card in and make sure you're happy with the alignment of it. I wanted mine to kind of angle inside the shaker card. Start placing all your "guts" into the shaker card. 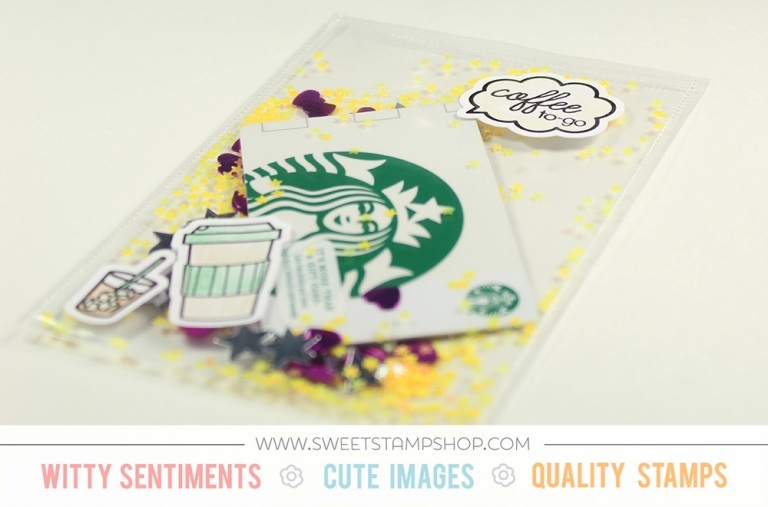 I chose some purple, silver, and yellow sequin confetti because I liked the colors with the green on the card. Plus, the stars kind of simulate the reward stars you receive in the Starbucks app! Once you have everything where you want it, seal off the top with your fuse tool. I also used my paper trimmer once more to trim the sides closer to the seam. Now you have a fun shaker card with a gift inside! You could do this with a lot of different Sticky Sweet stickers and Sweet stamps. Like, you could use the "Yum" sticker sheet with a restaurant gift card of your choice. You could use the "Stinky" sticker sheet for a Home Depot card for a quick house warming gift. 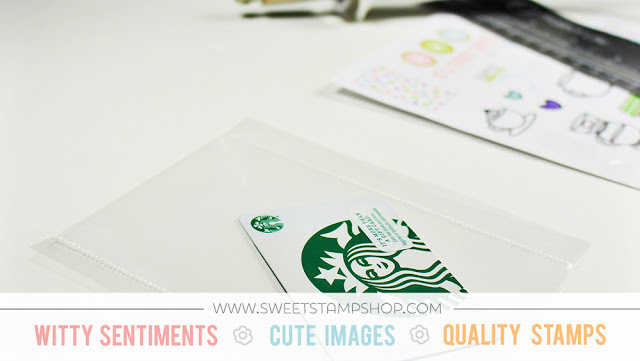 "Dog & Cat" Sticky Sweet would be super cute with a pet store gift card for new pet owners. The possibilities are truly endless with what you could create. I’d love to see the daily pages you come up with! Be sure to tag us in your Instagram pictures @SweetStampShop and also myself @Emilee_Speaks. Weight Watchers Smart Points initial review and results. Plus tips and meal ideas. Okayyy, I know it's not Wednesday... I got way too busy yesterday to get this post up. I really wanted to get this series off the ground though, so I'm posting it a day late. Back story: I joined WW in May and was doing GREAT until we got closer to my son's graduation. Life became so hectic that I fell off the wagon. Then we immediately went on a family vacation and I stayed off the wagon until last week. Now that doesn't mean that I went crazy and ate everything in sight, it just means I didn't track my points or weigh myself. So I have no idea what my progress was like during that time. With THAT being said, I have officially lost 20lbs or so! I can't imagine how great my progress would be had I kept at tracking my points during my "break". With this series my plan is to share my weekly weight loss [or gain], my favorite WW friendly meals & snacks, and just overall weekly experience. To get started I'm going to share how my last 2 weeks have been since I've been back on the program. I created a "WW Planner" out of a spare Happy Planner that I have [image above]. 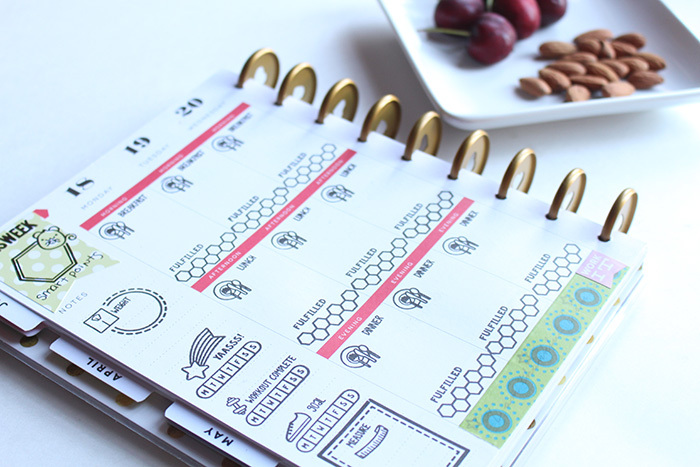 Using my favorite Sweet Stamp Shop stamps, I have created a perfect health & fitness planner. One of the things that amazes me about WW is that if you're smart with it, you NEVER feel deprived. I just make sure that I take advantage of zero point fruits and veggies, and lean protein rich food. Take advantage of the "Connect" social media aspect of the WW app. It's so incredibly inspiring! There's tons of info and help from real people just like you. I have found great resources by searching "#smartpoints" on Instagram. Lots of WW users share images of their favorite low smart point meals and recipes. I have found this to be incredibly helpful when trying to come up with meal ideas. Search YouTube for WW specific videos. There's several vloggers that share their meals daily. Another great resource! It has been so interesting to find out the actual nutrition and serving size of things. Serving sizes has been the most interesting to me, but not in the way you'd think! I've been surprised by how large a serving size is on some food. If I wasn't weighing my food with a scale, I'd definitely feel deprived because I'd be under eating my servings. English Muffins were something that surprised me. I didn't expect a "bread" food item to be so low in points. 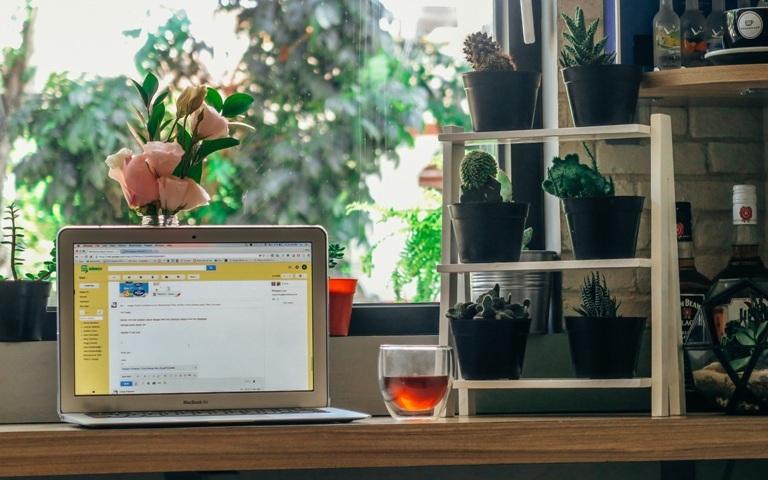 This can be very beneficial if you work outside the home. You can premake breakfast sandwiches to grab and go. I'm going to be real with you for a minute... I have NEVER had fresh cherries before! *gasp* I know, right?! Well my significant other picked up a package of them when I was picking up fruit and veggies. I tried one and I'm hooked. Holy cow. They're amazing! Who needs candy? I have a serious sweet tooth and I LOVE candy. All candy. Chocolate, gummy, hard. I couldn't believe how satisfying the cherries were to curb my sweet tooth. HOWEVER, moderation is key here... Yes fruit and veggies are "free", but that doesn't mean you can eat 3lbs of cherries a day and be successful. Snack plates for lunch. I picked up Bolthouse Farms Cilantro Avocado Yogurt salad dressing at the marketplace. Serving size is 2Tbsp and the serving is only 2sp. This is great paired with zero point veggies as a dip. I don't cover my veggies in it obvi, just a light dip to add some flavor zest. Right now I'm loving grape tomatoes, celery, and cauliflower this way. Pair that with some low point turkey pepperoni and a Babybel Light for a low point snack plate. Not so "naughty" naughty snacks. Aldi has amazing Pizzelle Vanilla Italian cookies. 5sp for 6 cookies! I like to take 2 cookies for 2sp and make an ice cream sandwich with 2Tbsp of Light Sugar Free Whipped Topping. This is an incredibly satisfying "naughty" dessert that is only 3sp! I created a separate Instagram account for WW. I post meals with points and motivational quotes. 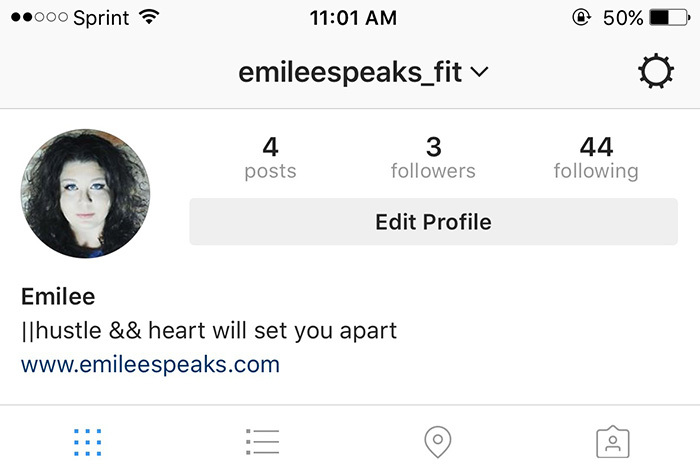 Follow me and let's inspire each other! Also... If you're on WW, come find me on Connect! It's been awhile since I've talked about my girls on here, so I thought it's the perfect time! Quick back story: in June of 2011 we took a drive to the local Humane Society to adopt a cat. June is national adopt a cat month! My son was heading to high school and I was home alone a lot. Our dog had passed away several months prior and I was missing having a companion when no one was home. When we arrived to the Humane Society, I fell in love with Quorra [on the left] my family fell in love with Igloo [on the right]. They were babies and crate mates. You could tell they had already developed a close bond. So we adopted both! It was the only decision that made sense to us. Here we are 5 years later and they're still best friends, and my best friends. P.S. I don't care if that makes me sound like a crazy cat lady! Haha! Adopting an animal is a huge responsibility. Please please please don't adopt a pet if you don't plan on keeping them their entire life. I'm going to help you through the process today! I have compiled a list of tips and a shopping list to make your transition with your new companion go smoothly. ♥They're less likely to be adopted than kittens. ♥They're grown and their personalities are established. You know what to expect. 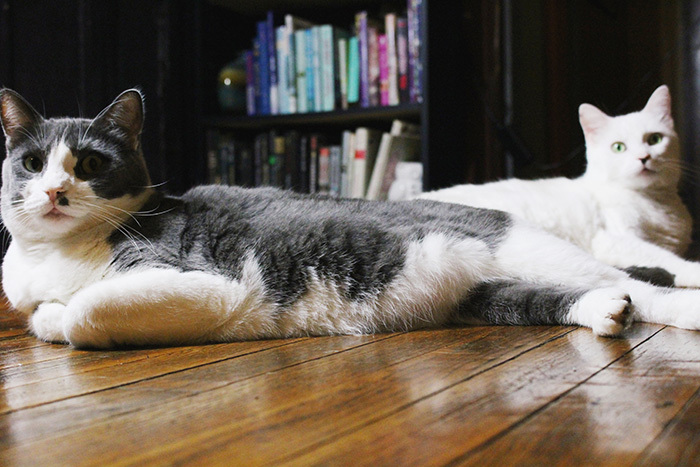 For instance, when we adopted the girls Igloo was a super wild and crazy kitten and Quorra was subdued and calm. Now it's the complete opposite. ♥You'll know how big they'll get. No surprises. ♥Get on the floor [yes on your hands and knees] and inspect your home from a cat's view. ♥Research local vets in your area prior to adopting. We do it with pediatricians so why not with veterinarians? ♥Our cats love all kinds of toys. They don't require the most expensive of toys and in fact choose random stuff to play with. They love empty toilet paper roll tubes and boxes. We shop online a lot and will leave the boxes on the floor for them for the day. They'll roll around in it, wrestle in it, and sleep in it. They LOVE boxes. ♥We all want and hope our cats have long healthy lives. However, sometimes accidents and illnesses happen. Vet bills can be very expensive. Research pet insurance to see if it will be beneficial to you. 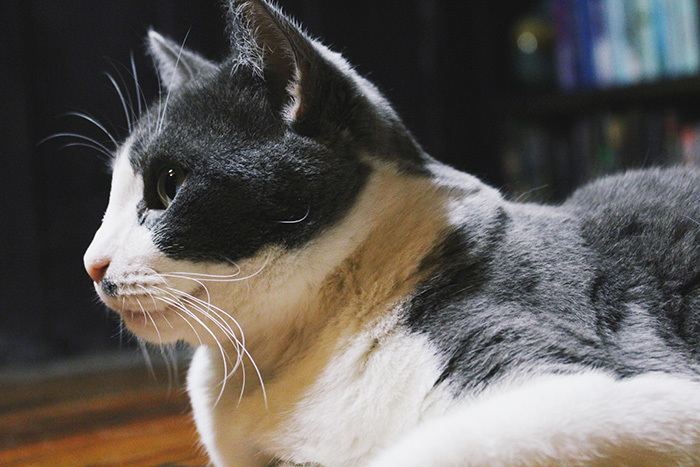 ♥Get your cat accustomed to grooming as soon as you can. This will help you and the cat in the long run. Cat hair becomes a way of life, help yourself out and groom to eliminate excess cat hair. ♥Please find out if you're allergic prior to adopting. It'll be devastating to both you and the cat if you are unable to keep her due to allergies. ♥If you're adopting, chances are your cat will likely already be spayed or neutered. However, if they are not, this is SO IMPORTANT. Spaying and Neutering keeps unwanted population down. Your cat will live a longer & healthier life. It also helps cut out behavioral issues with cats. 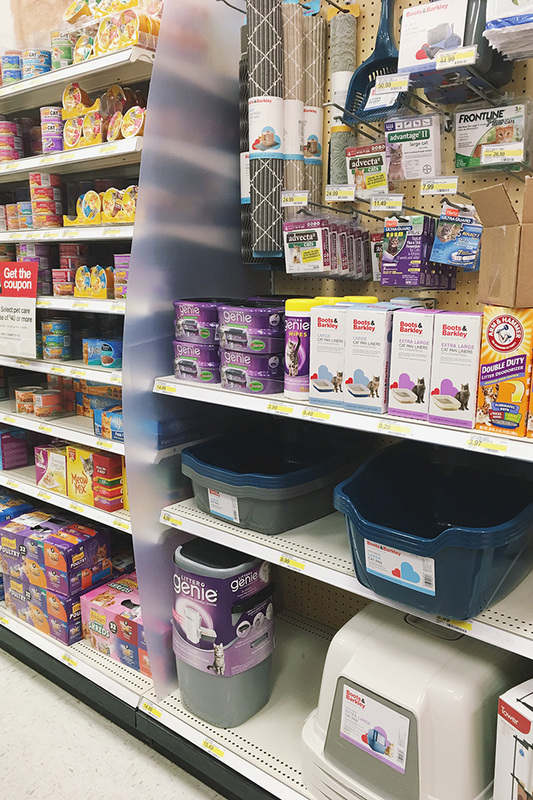 My favorite place to get supplies for my cats is at Target. They have a wonderful section for pets. Recently when I was at Target to pick up some cat litter, I saw the new Litter Genie® Cat Litter Disposal System. We live in an apartment and the only thing I HATE about being a cat parent is litter waste. Our dumpster is around the corner, behind the building, with no back entrance/exit [thank goodness for teenagers!]. 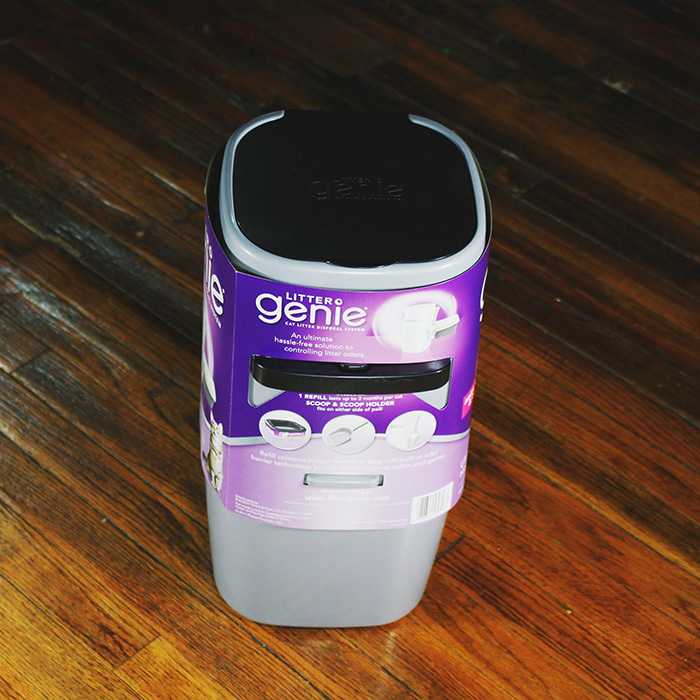 When I read the packaging on the Litter Genie®, I knew it was perfect for our home. While inspecting the product, a Target employee told me they couldn't keep them on the shelves. I got the last one they had in stock! The Litter Genie® Cat Litter Disposal System is hassle-free and discreet. 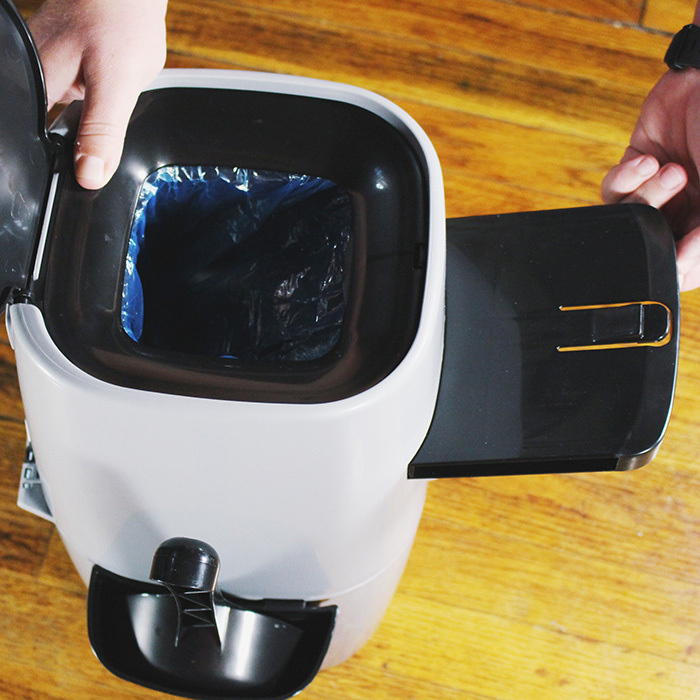 It looks like a trash can, but it's no ordinary disposal container. 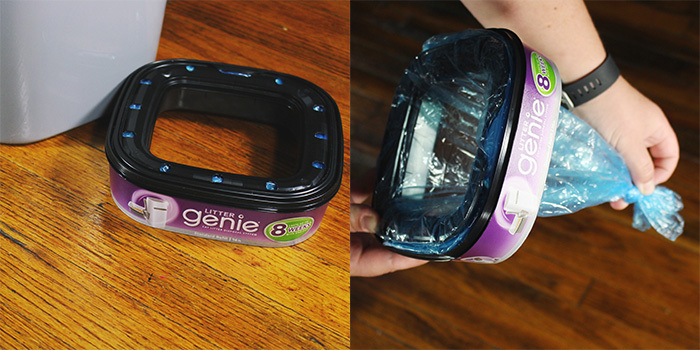 The Litter Genie® Pail helps lock in odor to make daily litter scooping a breeze. No more daily runs out to the dumpster to dispose of waste. It's compact design is perfect for apartments and dorms. Fits in bathrooms and cupboards. The Litter Genie® Cat Litter Disposal System comes with a scoop and a package of Litter Genie® Pail refill to get you started. One refill package contains 7 bags and each bag holds approximately 14 days worth of waste [single cat home]. The refill has a 7 layer barrier for ultimate odor control. The air-tight design helps lock in odors even with the lid open. So easy to use. Just scoop, open lid, pull handle, then close. Waste can be sealed up for up to 14 days [again, single cat]. I dispose of mine weekly because I have 2 cats. Once you're ready to dispose of the litter waste, just open the bottom section and use the attached cutter to cut the bag. Tie it off and dispose. We are all loving our new Litter Genie® Cat Litter Disposal System. I highly recommend it to every cat parent. Have you tried the Litter Genie® Cat Litter Disposal System? What cat parenting tips do you have to share? Decorated July 2016 monthly pages in a Limelife planner with Sweet Stamp Shop stickers. Super easy and adorable layout. Supplies listed. 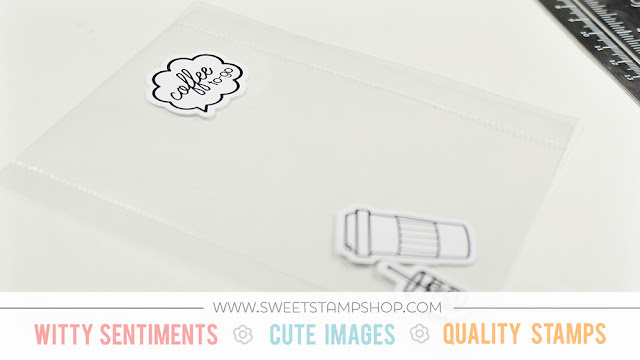 Sweet Stamp Shop released their brand new line of colorable stickers today! I've had these in my hands for a few weeks and have been just dying to share them with you. I chose to use them in my July MO2P for a quick super adorable decoration. I used the Superheroes sheet and colored them in with red, white, and blue for a more patriotic theme (I didn't even use a 1/4 of the stickers on the sheet on my pages. There's A LOT of stickers on the sheet). Using my regular old Crayola colored pencils, I went to town coloring these images in. SO. MUCH. FUN. As if that wasn't enough excitement for one day, Limelife Planners has launched their new products today too! Dying here. My two favorite companies releasing new products on the same day! 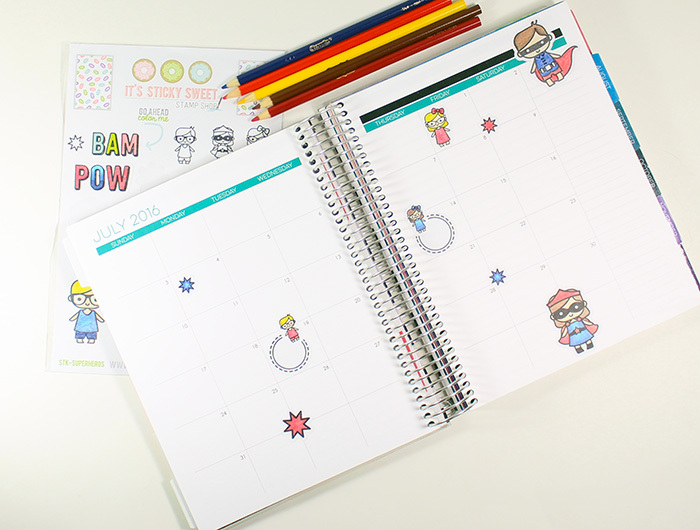 Limelife released new personal inserts for ring planners, a super awesome (I MUST have) 8.5x11 sized planner, adorable bookmarks for all sizes, and much more. I can't wait to share with you some of these awesome new products!